Rapid growth and sales force expansion in recent years had provided sales professionals at all levels with opportunities for promotion and increased responsibility. During this expansion, the organization struggled to identify internal candidates to assume management positions and had to quickly prepare newly promoted managers to move the organization forward. As organizational growth slowed and the size of the sales force stabilized, organizational leaders were concerned about the retention of sales professionals and leaders in a highly competitive marketplace. The sales force had become accustomed to rapid advancement and continued to seek the dwindling number of promotional opportunities. Leaders feared that professionals would choose to leave if they were not provided with a clear path for career development, appropriate rewards to recognize performance improvement and career progress, and a consistent and objective process for promotions from within. managed the career development process across the sales organization. Critical positions within the sales force were identified, as well as the detailed skill, performance, and experience requirements for those positions. Position requirements were translated into criteria and business rules that would be used for selection and promotion into each role. Lastly, developmental career paths were created that clearly defined the steps recommended for achieving each critical position. 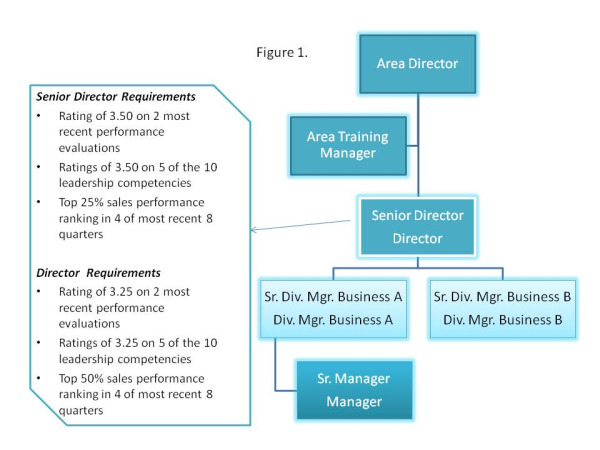 For example, Figure 1 displays the suggested career path for sales managers seeking to achieve an Area Director position. This talent database was updated on a regular basis via seamless data file transfers and periodic talent assessments to gather critical information that was not stored in other systems. Data on the performance and development of the entire sales force now resides in one easy-to-access place. manages the individual development plans for participants identified as high potential. External candidates view the development opportunities provided by the organization as an attractive benefit. Furthermore, the organization has been able to confidently continue their philosophy of promotion from within during several recent growth initiatives. The Succession Planning and Career Pathing program has prepared the sales force for the future: the organization can readily fill positions that arise from new product growth and acquisitions with in-house talent. Click Here Download the pdf of this Case Study.